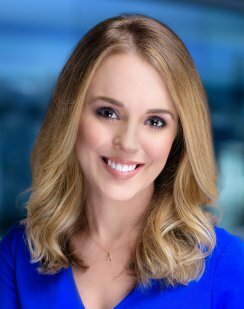 Morgan Kolkmeyer is the weather anchor for the WGN Morning News, weekdays from 4 a.m. to 6 a.m. She joined WGN as a meteorologist in May of 2017. Before joining WGN-TV, Kolkmeyer spent three years as a morning and midday meteorologist and news anchor for WREX (NBC) in Rockford, Illinois. She previously worked at KQDS-TV in Duluth, Minnesota, as a meteorologist and reporter. Originally from Rockford, Kolkmeyer graduated from NIU with a B.S. in meteorology and a minor in applied mathematics. Her love for weather began in August 2004, when she was in the eye of Hurricane Charley. Since then, she has gone storm chasing across the Great Plains.